It's odd to be a resident of coastal California in the fall. Most of the native trees don't lose their leaves, so we don't get much fall color. Plus, right around the first day of school, the fog disappears and leaves us with brilliant sunny days. Beach weather. It's torture when you're growing up, to start school right when the summer weather finally arrives! Enjoying fall, and celebrating it, becomes a more purposeful activity when there is less evidence of it around you. This year I decided to look for fall. It took some searching, but this is what I found. The light changes. Everything seems a little more crisp and clear and the sun leaves extra sparkles on the ocean. 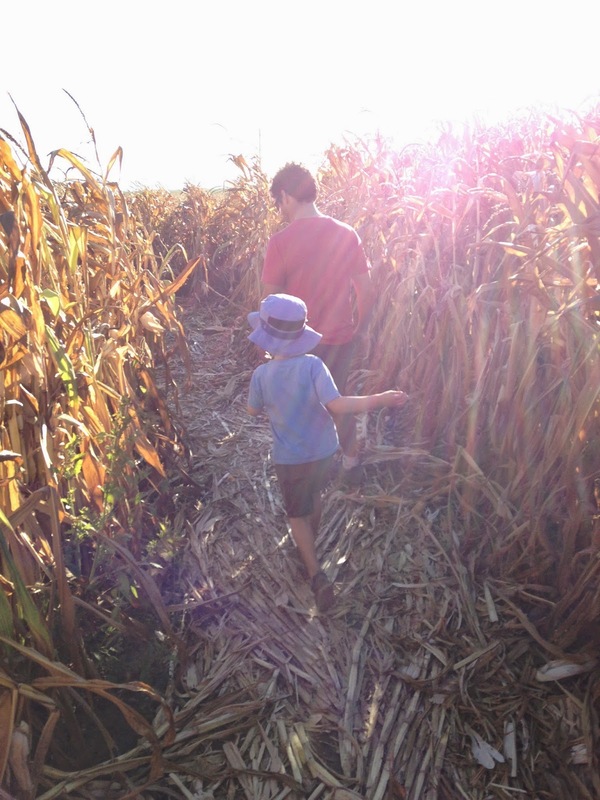 and get lost in their corn maze. There are many varieties of delicious apples to snack on. Strange, sparkly spiders take up residence over our front door. I cut back my garden, and plan for next year. As the days get shorter, I want to curl up in my cozy house and read! If you celebrate Halloween, I hope you have a wonderful time. And if you live in a place with glorious fall color and crispy cold weather, please blow it all a wistful kiss from me. I’ll be here on the California coast, continuing to look for little bits of fall. I would love to know what fall is like where you live? What are your favorite parts of the season? Claire, I'm impressed that you could find so many signs of fall there - and some in the most delightfully unexpected places! Autumn in central NY state is very changeable. Yesterday is was 70 and sunny. Today, 55 and gloomy. It can be crisply brilliant or raw and biting. And let me tell you, when the leaves hit the ground, it's a lot of work! But it has always been my very favorite season, and October is the month I would keep all year if I could. Despite the fickleness, this, to me, is perfection. We live by the California coast too Los Angeles so we share the same fall. I do love fall the best. All the leaves are changing, it's getting cooler now. We always have candy for the kids that come by here so we're be waiting for them this year too. I also like to do counted cross stitch Halloween pumpkins and then on small Christmas ones too and Thanksgiving too. I love all the Christmas romances that come out now too. Hi Kris, I'd love to see your autumn. Though you're right, I'm not sure how I'd feel about raking all those leaves! I agree that fall is my favorite time. As a teacher, I loved how it always felt like the new year... more than New Year's Eve. Hi Penney, my fellow coastal Californian! I really enjoy the trick or treating kids too! It's supposed to rain for Halloween, I hope that doesn't keep the kids at home this year. Your cross stitch sounds very pretty. And I agree... I LOVE the Christmas romances!! Thanks so much for sharing what you love about fall.